What locations does the website ship to ? We only cater to Indian market and do not ship internationally.We ship to most parts of the country except few places in North-East. So if you have a question on this, just check with customer care, to be sure. Do you charge extra for shipping ? If there are any delivery charges, it will be indicated during your check out process and included in your final order cost. At present , DELIVERY is FREE - the cost of shipping your order is on us, provided you pay for the order online. How soon will you ship out my order ? Payment authorization can take up to 24 hrs from the time you place the order. After payment confirmation, online orders are immediately processed. Can you deliver to my home or office ? Yes, we can deliver either to your home or place of work. Please ensure that someone is available to sign for your delivery. Are there any documents required by transporter ? This is a very important question : As per government regulations concern inginter state sale ,our logistics partner requires the following documents to be furnished by the customers to effect shipment to their address . For identity proof either a scanned copy of the driving license or PAN Card. A scanned copy of the letter stating that the ordered alloywheels are for personal use and notf or sale. How soon can I expect the order delivery at my doorstep ? We try our best to deliver orders to customers within 5 - 7 working days in major metro cities from the day the order is confirmed. For far flung locations however, the delivery may take up to 7 - 10 working days. Please note that the delivery time to the end user is subject to certain factors beyond our control including unexpected travel delays from our transporters due to weather conditions & strikes. Who is your shipping partner ? We have partnered with VRLlogistics, Patel Retail Logistics,Gati Cargoto help us deliver wheels . We use a selection of logistics & transport companies depending upon your location and reach. How are the wheels packed ? Each piece of wheel is checked thoroughly for scratches & marks before dispatch. Alloy wheel are securely packed in high quality cartons to ensure safe transit. We employ only reliable service providers to deliver products. How do I search for Alloy wheels for my particular car make and model? Easily find the alloy wheels you require with our handy FINDER. Simply select the car make , car model , tyre size, brand & choose from a wide range of available finish. ALLOY WHEELS FINDER is located on left hand side of our website. Can you give me good reasons why I should buy alloy wheels from your website ? How secure is it shop online from the website ? We use the latest technology available to offer and guarantee you a secure and easy online ordering facility. Each step of the ordering process is displayed in easy to follow stages to ensure that we obtain the correct details required to immediately process your order quickly and accurately. Not sure what you are looking for? Just call us! How can I be sure that you are selling genuine brands ? 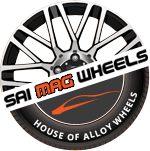 We are authorized distributors for all of the alloy wheel brands we stock. Take our word for it ! What is the warranty on alloy wheels? Products distributed by SAI MAG WHEELS are warranted against structural failure and defects in material and workmanship under normal and intended use for a period of one year from the original date of purchase. Please note : There is no warranty on chrome or polished finishes. If you have warranty claim regarding your alloy wheel please contact us . It is helpful if you can e-mail us pictures of your wheel, this usually helps to speed up the process in rectifying the problem. How accurate is information on the website? We try and insure that all the information on our website is correct but cannot guarantee that the website is completely free from errors. How accurate are the pictures on the website ? Sometimes it is not possible to have a picture for a wheel that is available in 4 & 5 stud. If you see a picture that has 5 studs and you also see a 4 stud fitment listed against the picture, this means that this wheel is available in 4 stud and vice versa. Nuts or bolts : What is the difference between wheel bolts & nuts ? If the vehicle has studs coming out of the hub, you will use a nut to fasten the wheel to the vehicle. Vehicles without studs will use a bolt to fasten the wheel to the hub of the vehicle. Do you provide nuts or bolts with wheels ? Bolts & nuts have various diameters , threads & seating . If necessary , our sales team will ensure the correct fitting kit is provided for your car with every wheel. What are hub rings or spigot rings ? Made from either plastic or metal, these allow perfect fitment and alignment of your alloy wheels when the centre bore differs from the hub lip diameter. A hub ring is fitted into the back of the wheel with an outer diameter the size of the centre bore and an inner diameter the size of the hub lip to allow the wheel to be correctly located onto the hub and to fit tightly and snug onto the vehicle for safety and comfort. Do you provide hub rings with wheels ? Hub rings are only provided , if necessary and free of charge. Do you provide Cash on Delivery (COD) payment option? Currently no payment option of cash on delivery of products is available. What is the payment gateway available on the website ? Payment gateway available on our website is CC Avenue. What are the payment options available on the website ? Does price include VAT (Value added tax) ? Price of all our products are inclusive of VAT (Value added tax) / CST (Central Sales Tax) at the current rate of 12.5 %. Octroi or other local taxes part of the price quote ? We cannot be responsible for any taxes levied on goods upon arrival in the destination state. Octroi & local taxes are not part of the quote. You will receive an email confirmation from us once your order is successfully placed. This mail will have all the details related to your order. If your account has been debited after a payment failure you can get in touch with us with your order number or email us on inquiry@saimagwheels.com for any clarifications.